"We know the park! Depending on the weather and your needs, we can always find a suitable route for the cyclists or hikers, free-flying areas for paragliding or recommend a beach for anyone searching for tranquility. 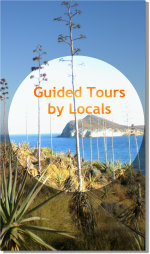 In addition, we are very well acquainted with the history and culture of this area and know a lot about the local flora and fauna and the uniqueness of the volcanic geology of the Cabo de Gata area." He has created and knows of more than 40 routes, many of them in Cabo de Gata Natural Park but also through Sierra Alhamilla and the Desert of Tabernas. Martin has created the following video (for the time being in German only and hopefully he will finish the translation into English soon!) - Nevermind the language, get inspired by the scenery! Cabo de Gata is the perfect paradise for bikers and cyclists from all over Europe, specially outside the peak seasons. It is a micro-environment of its own, a last unspoiled corner in Europe! No need for you to bring your bike, Martin will arrange to rent one! Maybe you rather prefer feeling like a bird? - Join Martin on a Paragliding tour.